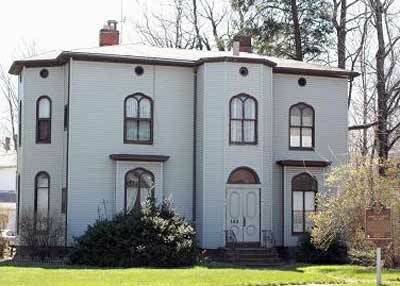 Where would you find this interesting house - and who lived there? The house is at 143 Mentor Avenue in Mentor in Lake County. The house belonged to Thomas Harvey who was born in 1821 in New Hampshire. In 1833, his family moved to Concord Township in Ohio and at the age of fifteen, Harvey left home and moved to Painesville. In 1851, he became superintendent of Massillon, Ohio schools, a position he held for fourteen years before becoming the superintendent of Painesville's schools. In 1871, Governor Rutherford B. Hayes appointed Harvey as the Ohio State Commissioner of Public Schools. 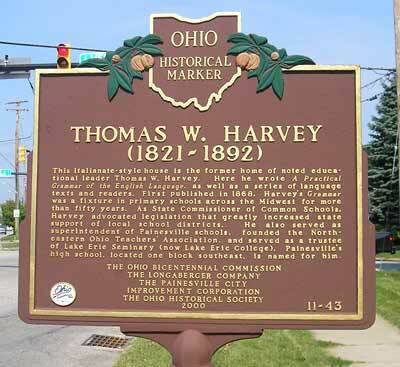 During his career, Harvey also helped establish the Ohio State Teachers' Association and the Northeastern Ohio Teachers' Association. Harvey is best remembered for his contributions to textbooks during the mid-to-late nineteenth century. He revised McGuffey's readers. He also authored several grammar books himself, including Harvey's English Grammar in 1868 and The Graded School Primary Speller in 1875. Harvey died in 1892. 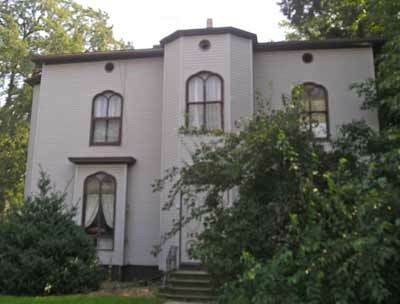 This Italianate-style house is the former home of noted educational leader Thomas W. Harvey. Here he wrote A Practical Grammar of the English Language, as well as a series of language texts and readers. First published in 1868, Harvey's Grammar was a fixture in primary schools across the Midwest for more than fifty years. As State Commissioner of Common Schools, Harvey advocated legislation that greatly increased state support of local school districts. He also served as superintendent of Painesville schools, founded the Northeastern Ohio Teachers' Association, and served as a trustee of Lake Erie Seminary (now Lake Erie College). Painesville's high school, located one block southeast, is named for him.